GWST-5040 / 120 units per case. : PET-G BLUE MED blister with Tyvek® cover; 'Single unit' packed. 4 Dishes per blister x 30 blisters = 120 Units per case. STERILE R by Gamma irradiation, 10 kGy minimum. NOTE: Products are sterile, until packaging is opened or damaged. 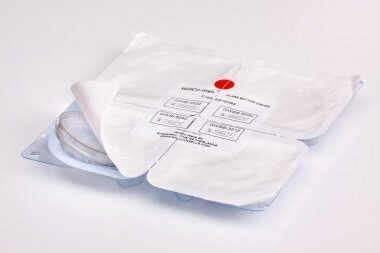 POUCH-PACK : 200 Units per case, 10 sleeves of 20 units; STERILE R by Gamma irradiation. 500 DSA rings, 500 coverslips, a coverslip tweezer and a pair of Latex gloves. to bond the coverslip "Safe, Easy, Accurately/precise and Quick". NOTE: The Device comes separate. * With the "kit", a 'Do-It-Yourself' WillCo-dish® Glass Bottom dish, you also save a lot of money! If you have just any questions concerning our products or packaging, please do not hesitate to contact us. to have the following information, on your goods. 1 Case: Size: 36 x 28 x 19 cm. / Volume: 0.02 m3 / Weight: 1.95 kg. 2 Case: Size: 36 x 28 x 39 cm. / Volume: 0.04 m3 / Weight: 3.90 kg. 3 Case: Size: 36 x 28 x 59 cm. / Volume: 0.06 m3 / Weight: 5.90 kg. 4 Case: Size: 36 x 28 x 66 cm. / Volume: 0.08 m3 / Weight: 7.90 kg. 5 Case: Size: 36 x 56 x 59 cm. / Volume: 0.12 m3 / Weight: 8.85 kg. (We add one empty case, for the right 3+3 shape). 1 Case: Size: 26 x 22 x 18 cm. / Volume: 0.01 m3 / Weight: 1.60 kg. 2 Case: Size: 26 x 22 x 36 cm. / Volume: 0.02 m3 / Weight: 3.30 kg. 3 Case: Size: 26 x 22 x 54 cm. / Volume: 0.03 m3 / Weight: 4.90 kg. 4 Case: Size: 43 x 35 x 25 cm. / Volume: 0.037 m3 / Weight: 6.70 kg. 5 Case: Size: 53 x 43 x 25 cm. / Volume: 0.057 m3 / Weight: 8.95 kg. (We add one empty case, for the right 3+3 shape). 1 Case: Size: 36 x 28 x 19 cm. / Volume: 0.02 m3 / Weight: 2.45 kg. 2 Case: Size: 36 x 28 x 39 cm. / Volume: 0.04 m3 / Weight: 4.90 kg. 4 Case: Size: 36 x 28 x 65 cm. / Volume: 0.08 m3 / Weight: 9.90 kg. by SCHOTT. Supplier of our glass, is Thermo Fisher (Former: Gerhard Menzel GmbH.). 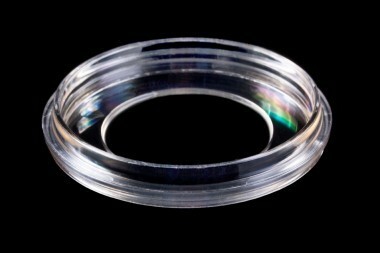 information on the 'glass bottom' of our WillCo-dish®'es. Class #1.5H: 170 micron +/- 5 micron, with flatness (Ra) 0.005 mm. (H: Specially selected glass). Class #1.5 : Everage of 170 micron (160 - 190 micron), with (Ra) 0.01 mm., as well as (Ra) 0.005mm. NOTE : We do not use coverglass with these specifications, in our standard production, anymore. Class #1 : Everage of 140 micron (130 - 160 micron). Flatness (Ra) 0.01 mm., only. NOTE : For these specificatios, we receive requests, only rarely (twice a year). Delivery times are long. 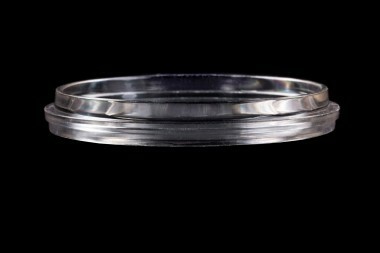 When speaking about Glass Bottom Dishes, there are two definitions of 'flatness'. First, there is the flatness of the glass coverslip bottom of the dish, where the glass coverslip is bonded to the dish as such, that it is absolutely horizontal when positioned on the warming-stage (- and should be flush with the warming-stage; only then, there is no air buffer!). Positioned flat or horizontal means, that the light of the microscope passes through the glass bottom orthogonally (very important) and that your cells stay in focus, when you move the warming-stage to another position (E.g. but not limited to: Time Laps Microscopy). When the glass coverslip is flush with the stage, it means that there is no air-buffer, between the glass and the warming-stage. The WillCo-dish® design, was - and is, the first dish to have this exceptional design. That is what makes the WillCo-dish®DESIGN of such an unique nature. This feature too is very important, because it ensures an even distribution of the heat, from the warming-stage to the media/liquid, inside the dish. All cells will be heated evenly, essential for the well being of your precious cells and for the success of your work! Note: If this is not the case, if there is an air-buffer between the warming-stage and the bottom of the glass coverslip, there will be an uneven distribution of the heat to your cells. They will arrest in their development, their life span will shorten and it will influence the results of your work, dramatically. Secondly, when discussing 'flatness' of the glass coverslip, we mean the surface flatness (Ra) or roughness of the surface of the glass. We offer two specifications; surface flatness Ra 0.005 mm. (standard) and Ra 0.01 mm., which surface is twice as rough. We use specially selected glass only, thickness #1.5H, 170 micron glass +/- 5 micron, as well as this Ra 0.005 mm. flatness, for all our standard production. clean room, where we manufacture our WillCo-dish®es. Besides, we only rarely received an inquiry, for coated glass. short term cultures, collagen can be simply applied to glass coverslips and allowed to dry. 1. Dilute collagen solution 1:10 - 1:50 with 30% ethanol and spread over surface of sterile glass coverslip. 2. Air dry in a tissue culture hood. 3. Cells can be seeded directly on the collagen surface. 4. 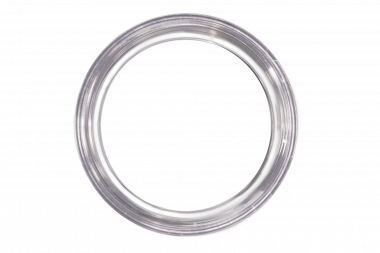 Collagen coating prepared in this way tends to detach from the glass in long-term cultures. polyornithine. This provides a more stable collagen coating. 2. Add enough solution to pool over surface of sterile glass coverslip. 3. Incubate 2-24 hours at room temperature. 4. Aspirate solution and wash coverslips 3 times with water. 5. Pool collagen solution, 100 ug/ml in water over surface of coverslip. 6. Incubate 4 - 16 hours. 7. Rinse once with media and seed with cells. Alternatively, for long-term cultures, double layered collagen coatings can provide a stable coating. 1. Spread a couple of drops of sterile collagen I solution on the sterile glass coverslip. 3. Wash coverslips twice with sterile water. 4. Gently spread a couple of drops of collagen over the surface of the gelled collagen and air dry. 5. 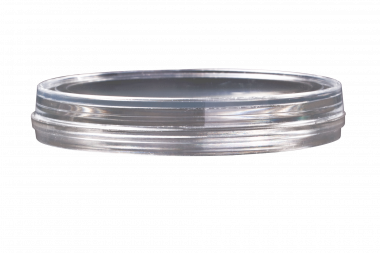 Use within a few hours for cell culture. Gelatin can also be used for the culture of some cell types including glial cells. 1. Dissolve 100 mg gelatin in 100 ml water (triple glass distilled or RO). 3. While hot, thoroughly mix gelatin solution. 4. Add enough solution to pool over surface of sterile glass coverslip. 5. Chill for 2-24 hours at 4oC. 6. Remove gelatin by aspiration and add sterile water. 7. Dishes can be stored for up to one week at 4oC. breakdown by proteases released by cells. 4. Aspirate solution and wash coverslips 3 times with media or PBS. 5. Immediately add cell suspension or growth media. Fibronectin is an extracellular matrix constituent use for the culture of endothelial cells, fibroblasts, neurons and CHO cells. 1. Stock solution can be prepared by dissolving 1 mg/ml fibronectin in PBS. Filter sterilize and freeze in aliquots. 2. Diluted stock solution to 50-100 ug/ml in basal medium or PBS. 3. Add enough solution to pool over surface of sterile glass coverslip. 4. Incubate for 30-45 min at room temperature. 5. Aspirate to remove fibronectin and rinse coverslips with media or PBS. 6. Immediately add cell suspension or growth media. Do not allow coating to dry. 1. Stock solution can be prepared by dissolving 1 mg/ml laminin in PBS. Filter sterilize and freeze in aliquots. 2. Diluted stock solution to 10-100 ug/ml in basal medium or PBS. 4. Incubate several hours at room temperature. 5. Aspirate to remove laminin and rinse coverslips with media or PBS. concentration of laminin applied using this method.